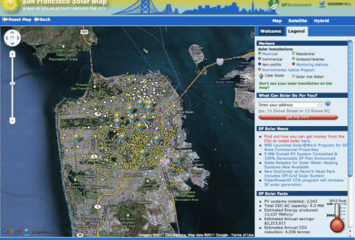 On December 20, 2011, Google announced a $94 million investment in four solar PV projects near Sacramento, California. This brings the company’s total clean-energy investments to $915 million, $880 million of that in 2011 alone. Though Google is heavily invested in wind power, solar is their energy of choice, constituting the majority of their “clean-tech” funding. In fact, Google’s history of investing in solar energy began five years ago with a focus on research, and has since shifted towards the implementation of large-scale projects. Google’s philanthropy arm, Google.org, launched its Renewable Energy Cheaper than Coal (RE<C) initiative in 2007. RE<C’s mandate was to sponsor research on “breakthrough” renewable technologies and to help lower the costs of renewable energy. Google.org funded companies (such as Brightsource Energy and eSolar) to help them develop concentrating solar power (CSP), a technology that uses sun-tracking mirrors (heliostats) to direct solar energy to a receiver mounted atop “power towers.” The system produces the steam required to spin a turbine to generate electricity. RE<C research focused on reducing the cost of heliostats and the cost and water consumption of CSP systems. Google ceased operations of RE<C in November of 2011, as new challenges arose which it felt other institutions would be better equipped to deal with. 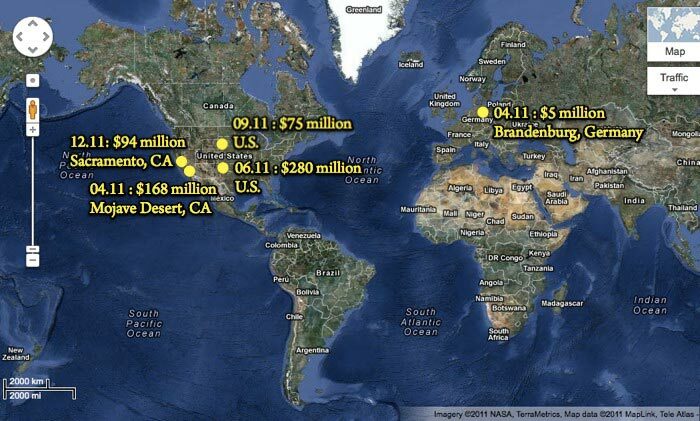 Google is now focusing on financing large projects, something they know a thing or two about. Before shutting down RE<C, Google shifted its investment focus from R&D for renewable technologies to implementation. The company now invests in a number of projects totaling 1.7 GW; enough electricity to power over 350,000 homes. December 2011 – Recurrent Energy | $94 million | Sacramento – This most recent investment will fund the construction of four solar PV projects outside of Sacramento, California. With a total capacity of 88 MW, these power plants will provide enough electricity to power 13,000 homes. The Sacramento Municipal Utility District has agreed to purchase this power under a feed-in tariff program for a period of 20 years. September 2011 – Clean Power Finance | $75 million | USA – Google is facilitating the solar aspirations of 3,000 homeowners with this investment. Clean Power Finance connects solar installers with investors (in this case, Google) willing to finance homeowners who are interested in a solar PV system. The homeowner gets a free system installed on his or her roof, and pays a monthly rate that’s often less than the cost of energy purchased from the grid. The program’s obvious benefit is that it speeds up solar power adoption, and it also has the capacity to lower costs. June 2011 – SolarCity | $280 million | USA — In its largest clean-tech investment to date, Google injected $280 million of capital into solar systems provider SolarCity, in an attempt to make residential solar projects more accessible. This funding is expected to open the solar gateway to 8,000 new customers through solar leasing or power purchase agreements. Google pays for the solar system and gets payback from both the homeowner and SolarCity in the form of lease payments. This innovative financing model removes the biggest barrier to solar adoption — initial system purchase. April 2011 – Capital Stage AG | $5 million | Germany — Google chose Germany for its first international clean technology investment. With this deal, they picked up a 49% equity stake from German financial investor Capital Stage AG in the recently-built Brandenburg solar project. This is one of Germany’s largest solar plants, with a peak capacity of 18.65 MW, or enough to power 5,000 homes. In December of 2009, Google formed the subsidiary Google Energy and simultaneously requested permission to buy and sell wholesale energy from the USA’s federal government. This initiative gives Google the flexibility to buy high-quality, affordable and renewable energy, so that it can better fulfill its corporate objective of carbon neutrality. Some feel this move marks the search giant’s entry into the energy business. Google representative Niki Fenwick alluded to the company’s possible intentions in a CNET report. 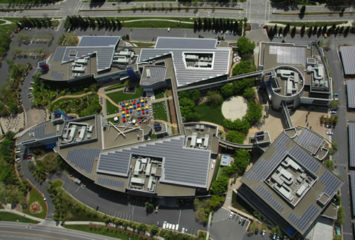 Google Energy symbolizes the company’s commitment to a carbon-neutral future. Slapping solar panels onto its rooftops and purchasing renewable energy from suppliers to feed its excess demand is just a small step towards sustainability and long-term profitability. Google has the cash to make massive investments in renewable energy and they’re committed to spending it. Google has been on the lookout for high-quality, affordable and renewable energy to fuel its power-hungry servers. With the flurry of recent clean-tech investments, Google Energy could become a significant player in the clean energy economy of tomorrow. Whether that is the company’s intentions or not, their significant injection of capital into clean-tech serves as a model for other corporations looking to invest their profits. The speed at which these investments have been happening signals not just a commitment to do something for the environment, but to get to market fast. For Google, the time for a clean-energy revolution is now.